Editor's Note: This article was written before the author saw FORGET ME NOT (63/317). Xena and Gabrielle's relationship suffers a serious setback during the "Gab-Drag". In this paper I hope to explore the use of Tarot symbolism in THE BITTER SUITE (58/312). But first it will be necessary to devote some time to the exploration of the relationship between Xena and Gabrielle. Also, certain aspects of Xena's redemption must be studied so that we can see how the relationship and the redemption may have compounded to initiate a chain of events that bring these characters to "where they are" just before they go off the cliff in THE BITTER SUITE (58/312). Xena did not come easily to redemption. She was a murderer and a robber. She appeared content with that lifestyle until her men deposed and exiled her from her army. Xena was forced to walk the gauntlet, which nearly killed her. Then, still not having had enough of it, she devised a plan to kill Hercules. Her thinking was that her men would reinstate her as head of the army if she succeeded in killing the hero. Even when Hercules defeated her and spared her life, Xena was still not ready to find redemption. She went off to search her soul. Only then did she decide to turn her life around. Xena accepted redemption only because redemption was her final option. Once Xena decided to follow the path of redemption, she was unsure about what to do to make up for her evil past. She decided on the course of fighting evil, stopping warlords, and working for the common good. She often stated that one only had to do good to be good, and that redemption and forgiveness came from within. Unfortunately, Xena did not believe this. Xena's dilemma was that she felt she was unforgivable. Also, she engaged in an exercise of atonement through mathematical formula, simply stated: How many good deeds make up for one evil deed? Or, more specifically, how many good deeds make up for just one murder? Using the formula, the key question became: How many murders has Xena committed? In her own mind, the answer was that she could not ever successfully atone. Another problem Xena had was that her quest for redemption was only a surface pursuit. Although her acts were both remarkable and laudable, and she truly thought she was going about it in the correct manner, and she did achieve much good, her problem remained that below the surface, she was still basically the same person. She was homicidal, angry, vengeful, self-righteous, controlling, impatient, ill-tempered, and dishonest with herself. She was also filled with such incredible rage that personal growth became extremely difficult. Eventually she came to a state of stagnation. Xena and Gabby's very first campire scene in SINS OF THE PAST. A fact easy to forget was that Xena wanted no part of a relationship with Gabrielle in the beginning. Gabrielle forced her way into Xena's life until Xena finally accepted her. Another easily forgotten aspect of the relationship was that their friendship was not a relationship of equals. They had a relationship between a mature experienced woman of the world and a naive innocent country girl (further complicated by the fact that Xena did not want Gabrielle around in the first place). Their friendship eventually blossomed whereby they developed a deep love for one another, but Xena remained the dominant member in the relationship. The relationship had three different aspects. There was a big sister-little sister perspective which sometimes spilled over into the aspect of a mother-daughter relationship. These two types were essentially loving and nurturing relationships. The final aspect was a knight/squire relationship which was essentially a master/servant association. All three aspects of this relationship conspired to hinder Gabrielle's growth, although Gabrielle left Poteidaia because she felt that she could not achieve any real growth in what she considered a stifling environment. The relationship was also a symbiotic one. Xena was committed to protecting Gabrielle's physical person, while Gabrielle was committed to protecting Xena's spiritual being. Gabrielle actually had the more difficult and more important role. Xena quickly learned that she could not do without Gabrielle whereas Gabrielle discovered quite early that she could easily survive without Xena's help. Gabrielle could always go back to Poteidaia or she could go with the Amazons. This knowledge, perhaps, added to Xena's need to control the situation. In her quest for redemption, Xena took on the attributes of the Warrior Monk and Crusader (please note that the term "monk" refers to any man or woman who chooses to dedicate his or her life to the search for and in defense of a spiritual ideal). In Xena's case, the spiritual ideal was her redemption. It was in this sense that Xena became the Warrior Monk. The old Xena adorned herself in gold, jewels, and silks. She drank to excess, smoked opium, and dined on exquisite foods. She was a slave to her desires and she fulfilled her wants at the expense of her own and everyone else's needs. She was excessive in her sexual gratification and she always lived in either civilized luxury or barbaric splendor. The new Xena was a follower of the philosophy of Stoicism. Her armor and clothing were serviceable and of good quality. She was either moderate or abstinent in her appetites. She was itinerant, preferring to live on the periphery of her society, also preferring to sleep in the open on the ground rather than in shelter. She appeared to be living in self-imposed poverty. It would make more sense if both Xena and Gabrielle had horses, but the one horse and two riders became a symbol of their poverty. This was the same symbol that the Medieval Knights Templar used to signify their own poverty by representing it on their standard. On one level, the television show, Xena: Warrior Princess (XWP), is essentially an allegory of the Journey to Spiritual Wholeness. In this, XWP becomes as much a spiritual quest as the search for the Holy Grail. The fact that Xena is spiritually flawed does not matter. All the knights in the Holy Grail Quest were also flawed. But Xena cannot achieve Spiritual Wholeness in her present state of stagnation. She must evolve. Also, the concept of the Warrior Monk is a flawed concept in that it needs inner growth in order to sustain itself. In order to fulfil the quest, Xena must move beyond the concept of the Warrior Monk and assume the mantle of the Spiritual Warrior. It should be noted that the Spiritual Warrior is often a Warrior Monk, but a Warrior Monk is not always a Spiritual Warrior. The Warrior Monk merely searches for and defends a spiritual ideal, while the Spiritual Warrior embraces that ideal and becomes one with it. While Xena may exemplify the aspects of the Warrior Monk, Lao Ma is an example of the true Spiritual Warrior. The Spiritual Warrior is that spiritually whole person for whom nothing is impossible. The Spiritual Warrior is a person of service. The truly redeemed master becomes the servant and the servant is the true master. Note that even though Gabrielle has taken on the role of the servant in the relationship, hers is the more important task. It is her duty to guide Xena toward the mantle of the Spiritual Warrior. The servant is the "Conscience Guide", and is, therefore, the true master. Thus, in order for Xena to fulfil her quest, her relationship with Gabrielle must be redefined. Xena is incredulous when she finds out "The child is Hope?!" Unfortunately, if there is no growth, it is only a matter of time before a relapse occurs. The relapse actually happens when Xena learns that Caesar is in Britannia. She immediately drops everything and sets out for the island. Her hatred of Caesar is such that she is willing to aid her old enemy Boadicea. Note that Xena hates and wants revenge on Caesar because he betrayed and crucified her, leaving her for dead. Xena betrayed Boadicea and tried to kill her, but Boadicea forgives Xena. In her thirst for revenge, Xena forgets about her responsibilities to protect Gabrielle, and Gabrielle is left to the mercies of Dahak, where she loses her blood innocence and becomes impregnated with a Demon Child. When the child is born, Xena demands that the child be killed. Xena had no right to demand this and Gabrielle had every right and duty to protect her child. Sometimes doing the right thing brings about disastrous consequences, but that does not alter the fact that the original decision was the morally correct one. Gabrielle's big mistake occurs in Chin when she betrays Xena in the hopes of saving her soul. This incredible act of naivete, I suspect, is a direct result of a combination of the stifling of Gabrielle's growth and the traumatic effects of the events in Britannia. Also, it shows that Gabrielle does not always trust Xena to make good choices based on solid ethics. Gabrielle is beginning to think that she is sometimes better off going against Xena's will and following her own course of actions. Unfortunately for both Gabrielle and Xena, since Gabrielle was not allowed to fully develop in both wisdom and maturity, Gabrielle makes a foolish choice with disastrous consequences. A shocked and bewildered Xena is shaken enough that she actually momentarily attains the mantel of the Spiritual Warrior. She is even able to throw the cosmic bolts, as did Lao Ma. But then, in a fit of rage, Xena kills Ming T'ien and loses everything she had gained. Lao Ma could easily have killed Ming T'ien, but she refused to. He was her child, and she did not want Xena to kill him either. She merely wanted to see him rendered harmless. What we overlook is that Xena is as much Ming T'ien's mother as is Lao Ma. While Lao Ma gave birth to the physical entity that was Ming T'ien, Xena gave birth to the spiritual entity. As Ming T'ien said to Xena, "It is you who made me into the monster I am". The killing of Ming T'ien was an act of pure murder brought about by the fact that Xena was incapable of controlling her internal rage. The journey to Chin was an unmitigated disaster. Instead of fulfilling Lao Ma's last request, Xena ended up destroying much of what Lao Ma stood for. The relationship between Xena and Gabrielle is now seriously harmed. Xena cannot trust Gabrielle to look after her spiritual person and Gabrielle cannot trust Xena to protect her physical person. When the fast-growing daughter of Gabrielle re-enters their lives, Gabrielle no longer trusts Xena enough to confide in her. She hides the knowledge of Hope's presence from Xena until it is too late. When Hope kills Xena's son, Solan, mistrust turns to estrangement and hatred in Xena. The Karmic Law is a cruel law; it was never meant for Xena to kill Lao Ma's son, and now Xena's own son is dead. I feel that Gabrielle was blameless in both her protection of Hope and in the death of Solan. Gabrielle even takes on the heartbreaking task of killing Hope herself, which shows her courage, her commitment to the relationship with Xena, and her commitment to humankind as a whole. (After Hope has fully revealed herself as the Demon Child, Gabrielle is both morally right and duty bound to kill her.) Only when Xena tries to murder her does Gabrielle finally scream out, "I hate you!" Thus, we come full circle only to find the current Xena a far worse permutation than the evil Xena we first encountered. We also see that the moment she screams, "I hate you!" is the moment Gabrielle really loses her innocence. After Gabrielle kills Meridian and loses her blood innocence, she tries to put both her life and her belief structure back together, but when she screams, "I hate you", and attacks Xena, this is an act of pure hatred and rage. In this action, Gabrielle makes a conscious decision to throw away everything she believes in for a chance at getting even with Xena. Just as the Twelve Steps to Recovery has become the main tool of recovery for the mainstream self help groups, so Tarot Cards have become a major source of insight for the New Age self help movement. Affiliate groups believe that The Tarot can be a path to new self awareness and an aid to understanding the human condition as it relates to the universe. In THE BITTER SUITE (58/312), we are introduced to a Tarot-based universe called Illusia. It is in this world that Xena and Gabrielle must work out their problems and get back on course. To better understand how the Tarot works, I shall attempt to give some basic rules. (It should be noted that I am not a student of the Tarot, and the readers are advised to do further reading if they are interested in the subject.) Tarot Cards are dealt either face up or face down. When the card is face up, it is said to be "in the reading" when the card is face down, it is said to be "in the reverse". When the card is in the reading, this is supposed to reveal the positive aspects of the card, while the negative aspects of the card are associated with the card when it is in the reverse. The individual for whom the cards are being read is the seeker or the quarrent. A seeker often has a signature card; this card is thought to be representative of the seeker. "Aleph am I. From mine unfathomable will, the universe hath its beginning. In my boundless wisdom are the types and patterns of all things". The Universe is the last card in the deck, but it becomes Xena's and Gabrielle's first card. This card shows a woman representing Supreme Goodness framed in a wreath of olive leaves. She is the universal conscience. This woman caries the mandate of Heaven and she is the arbitrator of choice. The card is in reverse. This tells us that both Xena And Gabrielle have shown a refusal to learn the lessons in life. Not only are they not motivated, they are actually resistant to any change. 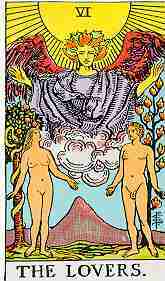 The Lovers cards depicts two naked people in the presence of an angel. This card represents the bonds of unconditional love, the polarization and attraction of opposites, and the harmonization of Duality. Note that while both lovers appear on the card together, Xena and Gabrielle arrive in Illusia separately. This is a sign of the extent of their estrangement in that they do not even show up on the same card. It also shows that both women have serious problems with duality in that they cannot reconcile the people they are with the people they need to be. It also shows that their love for each other is flawed in that it is conditional love. The Fool and her little dog make an interesting pair, especially since the Fool seems to be Callisto. In the royal court, the Fool is often portrayed as the wisest advisor to the monarch, and, often, as the most loyal, and as being totally without guile. The court Fool was also frequently thought to be insane. The little dog is a symbol of loyalty. In the Tarot, the Fool's wisdom is divine wisdom. The Fool freely offers this wisdom. In the Tarot, wisdom is always freely offered. In the reading, the seeker is being offered advice she would be wise not to refuse. In the reverse, the seeker does not realize the seriousness of her situation. Luckily for Xena there are so many cards following this one that the choice has already been made for her. Even though Xena would be wise to follow the Fool's advice, she refuses because the Fool seems to be Callisto. These two cards have been chosen as Xena's signature cards. Xena is dressed in the robes of the High Priestess and she is wearing the headdress, but on her chest is a sword, the symbol of the Queen of Swords. The High Priestess of the Celestial Temple embraces metaphysical enlightenment and inner illumination. She is the daughter of the Moon, and in her headdress she wears the full moon and the crescent moon. She is the guardian of the sacred law. The Queen of Swords signifies a strong, forceful, mature woman who is intelligent and instinctive. This woman is always dangerous, whether the card is dealt up or down. In the reverse, the High Priestess signifies a conceited, selfish and ruthless woman. She is a person who is refusing to understand what must be done. The Queen of Swords in the reverse signifies a cruel and deceitful woman. She will try to deter self-reliant action and individual development in others. Note that Xena discards the Headdress of the High Priestess, thus discarding her wisdom. When the High Priestess converges with the Queen of Swords and these two cards are in the reading, the arrival of the Spiritual Warrior is immanent. This is also true for the Magician and the King of Swords. This card is one of the most symbolic cards. 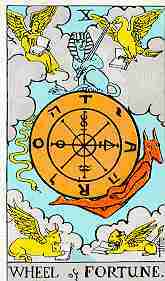 On the wheel are printed the words Yahweh (the unspoken name of God) and Tora (Torah). The sphinx reminds us of the transitory nature of the human condition. The jackal headed man is the Trickster and the snake is symbolic of creativity and wisdom. The four Living Creatures: the lion, the bull, the eagle and Humanity represent four signs of the zodiac, the four elements (earth, air, fire and water) and also the four gospels. In THE BITTER SUITE (58/312), they also seem to signify the struggle of life and death, specifically: the hunter and the hunted (the lion and the bull, the eagle and the snake, Xena and Gabrielle). The wheel is the wheel of destiny and of Karmic Law, but it is also the wheel of second chances. A spin of the wheel can erase the past and give a new beginning. This card signifies that Xena must take the risk of turning her life around. Actually, in Xena's case it is not much of a risk, since she has already messed up her life so badly. She is being given a second chance and she must get it right this time. She is being freed of the consequences of past Karmic Law, but she will be bound by future Karmic Law so she must be careful. Either up or down, this is a good card for Xena as long as she is willing to spin the wheel and take the chance. It means that her past will be erased. The Universe seems to be Xena's friend, and to have her welfare at heart. One way or the other, Xena is going to win. It is just a matter whether Xena takes the easy road or the hard one. Either way, Xena is going to grow up whether she wants to or not. Note that Xena is not the least bit interested in spinning the wheel. She only spins the wheel in the hopes that Callisto will lead her to Gabrielle. This card signifies that we must suspend our views and reverse the way we think about ourselves. (This becomes important when we see that Joxer is the Hanged Man). The man is hanging upside down from a living tree which signifies hope for the seeker, in this case, Gabrielle. Note that the man is not in pain, but in a state of serenity and deep thought. The card also signifies that the seeker has the gift of prophecy or is a clairvoyant. Also, the seeker must be willing to give up something that she considers valuable in order the gain something else of even more worth. Gabrielle is being asked to give up her past illusions. She is also being asked to re-examine her motives to see if they are honest. In the reverse, the card signifies somebody who is essentially selfish, and who puts on the appearance of making sacrifices, but, in reality, her first concerns are her own desires, rather than the needs of others. (This becomes important when Lila sings, "Take this scythe/ It is just a case of killing to be kind".) Gabrielle is again being warned about her motives. Xena arrives at a hall filled with warriors, and as she approaches the throne, she sees Ares dressed in the red armor of the Emperor. The Emperor would normally hold a rod shaped like an "ankh". This is the symbol of life and is also the astrological sign for Venus. It also signifies the rule of love. We must remember that we are talking about Ares here, and love does not enter the picture. Instead of the ankh, Ares is holding a sword, the symbol of the King of Swords. In the reverse, the Emperor card signifies the misuse of power, absence of self control and a person of low moral degree. 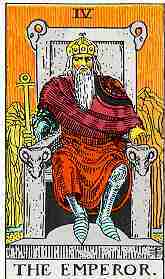 The King of Swords card, in reverse, warns of a dangerous ruinous man whose intentions are evil. One would be wise not to get caught up in this man's schemes. Xena is stripped of the clothes of the High Priestess, and is dressed in clothes and armor in both the red of Ares and the blue of the High Priestess. Remember that Xena discarded the headdress of the High Priestess of the Celestial Temple. Ares now offers her a new headdress -- a helmet in red and blue. Ares is offering, in effect, to make Xena his High Priestess of War. On The Chariot card, a prince is driving a chariot drawn by two sphinxes, a dark one and a light one, representing the duality of the human condition. It is the duty of the prince to harmonize these aspects of the human will and to bring them into balance with the will of the Universe. In THE BITTER SUITE (58/312), we are talking about Xena's human condition here and unfortunately for Xena, the Prince is Ares. "Unfortunately" may be the wrong word here. Xena is not being forced into anything she does not want. She has both feet in the water and she is loving every minute of it. In Illusia, there are no victims; There are only volunteers. Xena is wearing the helmet and she accepts the sword that Ares passes to her. The High Priestess of the Celestial Temple carries the Torah in her arms, the High Priestess of War carries a sword. Gabrielle is wearing the crown and myrtle leaves of the Empress and the dress of the Queen of Pentacles when she enters Poteidaia. These become her signature cards. The Empress is the arbiter of Earthly wisdom just as the High Priestess is the arbiter of Celestial wisdom. If these cards are both in the reading, then these two opposites meld to become Universal Truth. Unfortunately, these cards are in the reverse, and they merely show the extent of the rift between Xena and Gabrielle. 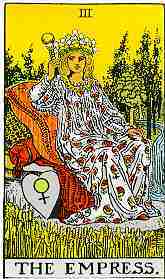 In the reading, the Empress signifies a woman who is kind and understanding, one who believes in cooperation and consensus. She is the mother of beauty and harmony. The Queen of Pentacles signifies a woman rich in spirituality. She is one who controls the bounty of the Earth and uses this bounty justly and wisely for the good of all. In many Tarot Decks, the stars in the pentacles are pentagrams. The stars on Gabrielle's dress are six pointed stars. Also, in some decks, the Queen is dressed in a reptilian hide garment to signify renewal. The Empress and the Queen can signify the coming of the Earth Mother when they are in convergence, and both in the reading. So note, if Xena were to kill Gabrielle, she would not only be committing murder, but she would also be committing sacrilege. In the reverse, the Empress shows a woman who has lost much of her own personal power because she sacrificed her own needs while attempting to meet the needs of another. She signifies co-dependance, indecisiveness, and the inability to work cooperatively. In the reverse, the Queen of Pentacles shows a greedy, selfish woman who is not as she seems. The Queen of Swords is a queen of aristocrats while the Queen of Pentacles is a queen of peasants and farmers. In the reverse, these two cards help to even widen the rift between the two women.